The JGAurora A5S 3D printer is an upgraded version of the JGAurora A5, featuring a handful of new components and features. Is it worth the uptick in price? Review the specs to find out. As the number of options that are available on the budget 3D printer market grow by the day, finding the machine that best suits your needs can be a trying task, especially for those who are new to the maker world. One of the more popular Chinese-made 3D printers to surface over the last few years is the JGAurora A5, an affordable and hefty piece of hardware with a decent build volume and some compelling features for novice users. When we reviewed the JGAurora A5 at the All3DP office, our feelings toward the 3D printer were lukewarm, as the overall printing performance was a tad bit inconsistent for our liking. Aside from the low price tag, the primary selling point of this 3D printer was its sizable build volume and intriguing attributes like power recovery and calibration assistance. Now, JGAurora has refined its flagship 3D printer, recently releasing the new and improved JGAurora A5S 3D printer. While this machine maintains the same build volume and basic features as the A5, it also has some interesting differences that could make it the superior option. 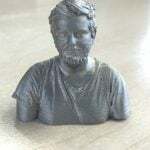 The decision to release an enhanced version of the A5 shows that JGAurora is following in the footsteps of other Chinese 3D printer manufacturers like Creality and Anycubic. 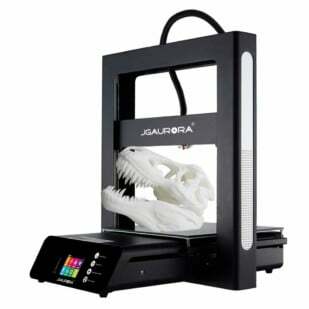 Similar to the Creality Ender 3 Pro and Anycubic Mega-S before it, the JGAurora A5S has been slightly modified and is now being marketed as a completely new 3D printer. This new fad of releasing improved iterations has led to the development of better 3D printers, albeit at a higher price than their respective predecessors. That leaves the prospective consumer with an important question: is it worth spending the extra money for the latest version? In the following article, we’ll take a closer look at the JGAurora A5S and figure out whether it’s worth choosing over the original A5. Let’s review the features and specs of this 3D printer. Before we get into the differences between the JGAurora A5S and the basic A5, let’s look at the many ways that the two are similar. The JGAurora A5S 3D printer comes partially assembled in just two main parts: the base and frame. These two sections can be connected with just a few screws and bolts, allowing the user to get up and running with the printer in around 15-20 minutes. From our research, we believe that the new A5S is still equipped with an E3D V6 hotend clone that has a custom heatsink, as well as the same Black Diamond Glass Heated platform, which is a glass plate with some additional coating for improved adhesion, comparable to the popular Anycubic Ultrabase. There’s still no automatic calibration, but the bed-leveling assistance makes the manual process as simple as possible. You also get the 2.8″ full-color touchscreen slapped on the front of the base, making it easy to navigate and modify settings. As far as we can tell, the price of the JGAurora A5S tends to fluctuate between $320 and $459. The cost varies depending on certain flash deals and discounts that online retailers are offering. On the manufacturer’s website, the new 3D printer is listed at $459. We’ve seen how most of the features boasted by the JGAurora A5S are identical to those found on the original, so what really sets the new version apart from the old? From our findings, it appears that most of the changes have been focused on improving the design of the 3D printer. To start, the manufacturer has added additional screws into the frame of the A5S, improving the overall stability. The extruder has been slightly raised to reduce the length of the Bowden tube, which we imagine is beneficial for the flow of filament. 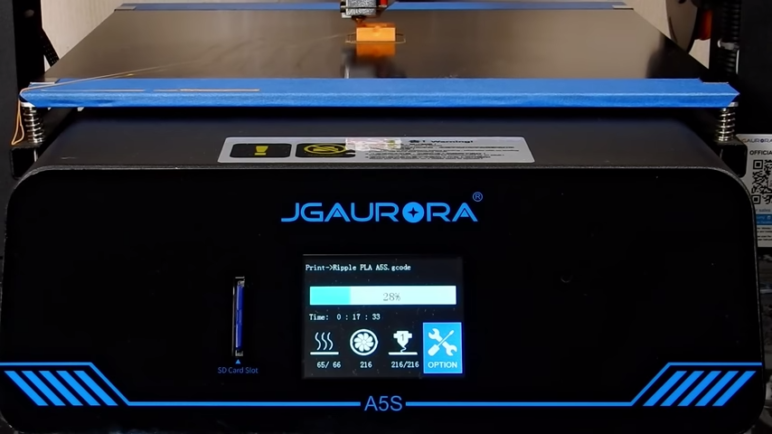 There are also some slight changes that aim to improve the usability of the JGAurora A5S, including the SD card slot, which is now on the front of the 3D printer, and a glass surface that extends to the end of print bed. While the JGAurora A5 came equipped with a handful of 3D printed parts, the manufacturer decided to replace these with injection molded parts, providing some extra durability to the components. Perhaps the most important upgrade made to the JGAurora A5S is the new 32-bit mainboard with A5984 stepper motor drives. Manufactured in-house, this new mainboard offers faster processing speeds and lower power consumption. It also has a silent motor drive and MOSFET tube that allows for better heat dissipation. Another small modification made to the mainboard is that the wiring for the motors and limit switches are now color-coded, making the wiring process slightly easier. Unfortunately, the firmware for the JGAurora A5S appears to be closed and scripted in-house, a factor that is sure to leave a sour taste in the mouths of open-source enthusiasts and Marlin users. Is it Worth Buying the JGAurora A5S? Considering that most of the improvements made to the JGAurora A5S were focused on the inner workings of the machine, it could be difficult deciding whether it’s worth spending the extra money for the upgraded version or not. In our view, it ultimately depends on what price you can find the new model for. The price of the JGAurora A5 usually rests right around $320 -350, so if you can get your hands on the A5S for just a few more bucks, we’d say the improvements are well worth it. However, for the listed retail price of $459, you’re probably better of sticking with the original or, better yet, looking into a more affordable option like the Creality Ender 3 or Anycubic i3 Mega. Nonetheless, the JGAurora team has integrated some pretty impressive under-the-hood enhancements into the new A5S, most of which are attempting to improve the printer’s overall performance and usability. And, in a budget market where many hardware changes tend to be superficial and aesthetically-driven, that’s something we certainly get behind. You can purchase the JGAurora A5S from Amazon, Gearbest, and other online retailers. If you want to find the best possible price, be sure to check all of your options to find potential flash deals or discounts. 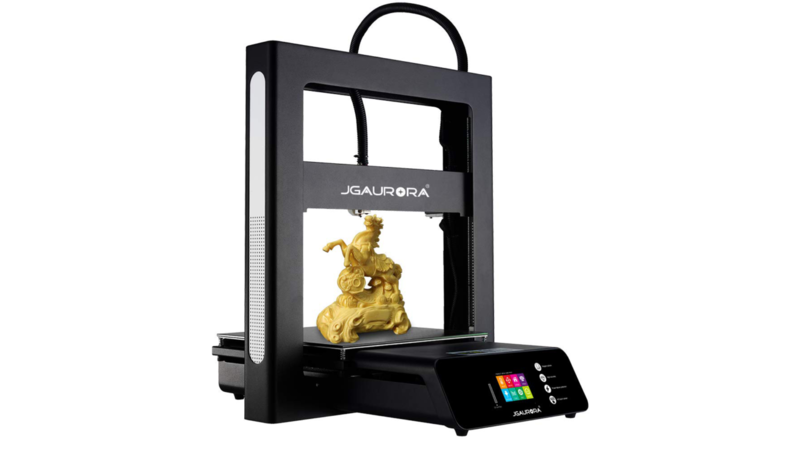 License: The text of "2019 JGAurora A5S 3D Printer – Review the Specs" by All3DP is licensed under a Creative Commons Attribution 4.0 International License.